The Seashell theme wedding can be a glamorous or whimsical beach theme. 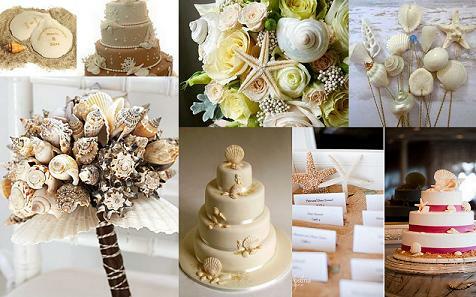 If you loved finding seashells at the beach this will be a magical theme for your special day. Seashells, Sand Dollars, and Starfish can be found ready for use at most party supply stores or online. Choose large shells like Conch for your focal shells, and work with smaller shells to add depth and texture. For a Seashell theme wedding, Conch shells make a great flower holder. You can fill in the opening with a bit of floral foam, and add tropical flowers for a stunning look. Create an aisle border using bamboo candles in varying heights, use seashells in the spaces. Tall vases filled with sand and then topped with seashells also looks beautiful. Use Seashells to decorate your chairs by tying a string of them to the back or sides of your chair. Even if you only decorate the back row and chairs near the isle, they look great. Like the Hawaiian wedding theme,use tiki torches to lead your guests to the reception site after the ceremony. For your wedding reception decorations, seashells applied to a fabric panel make a great backdrop for a bar, wedding party table or cake table. You can also attach shells to the bottom edges of your table linens. The shells are easily sewn on if you drill a small hole at the base for the thread to go through. It's very similar to sewing on buttons, and your wedding party can help. 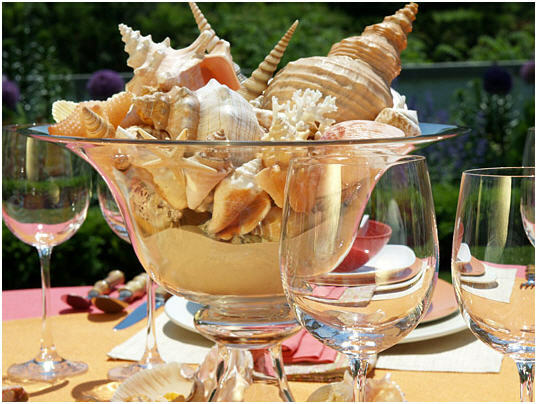 Reception table centerpieces for your Seashell Theme wedding can be elaborate or simple, depending on your taste. Conch shells again, will work well if used as a base for a floral centerpiece. You can also use a shallow dish, filled with sand and shells, and place a large piece of coral in the center as a focal point. Place these in the center of the table and surround them with birds of paradise, antherium or other tropical flowers, or keep it simple and use just the sand and shells. To complete your table, glue Starfish or Sand dollars to a plain napkin ring. By now your seashell theme wedding is really coming together. Check back for more ways to really bring this theme to life.